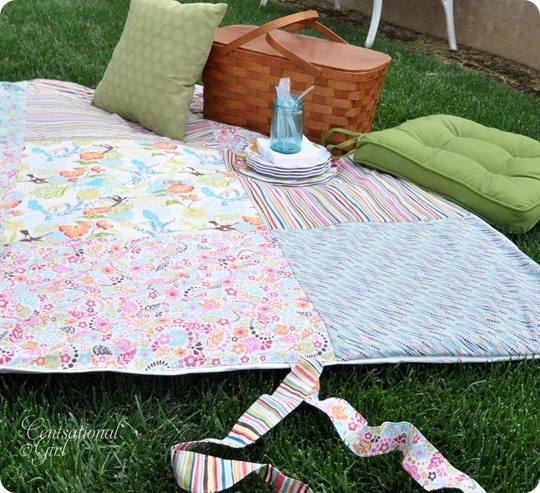 I’ve had this vision in my head for months now, a vision of crafting a picnic blanket that we could bring on our outdoor adventures, something with a country feel, but with fresh modern color too. 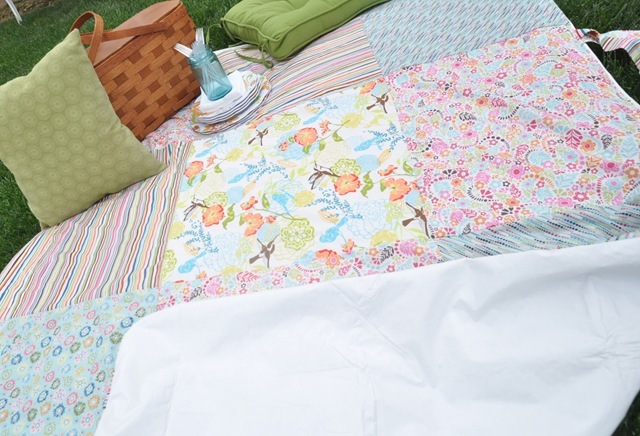 We’re a picnicking tribe on the weekends when sunny skies appear, whether we head to the coast, the local park or ballgame, or just movies in the park. 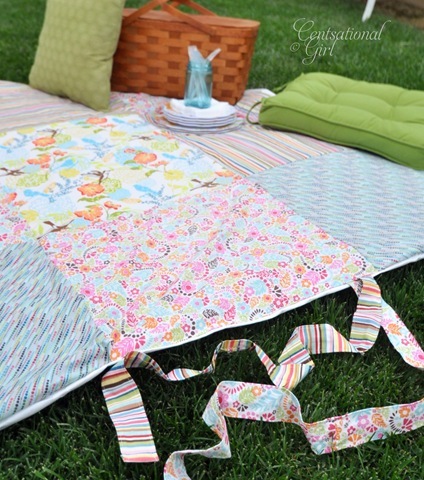 Having a cozy picnic blanket is always ideal! 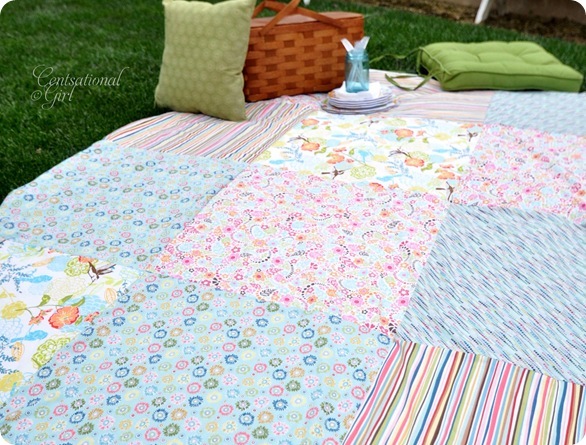 I’ve always wanted a patchwork picnic blanket, and last weekend I finally got around to making this one. 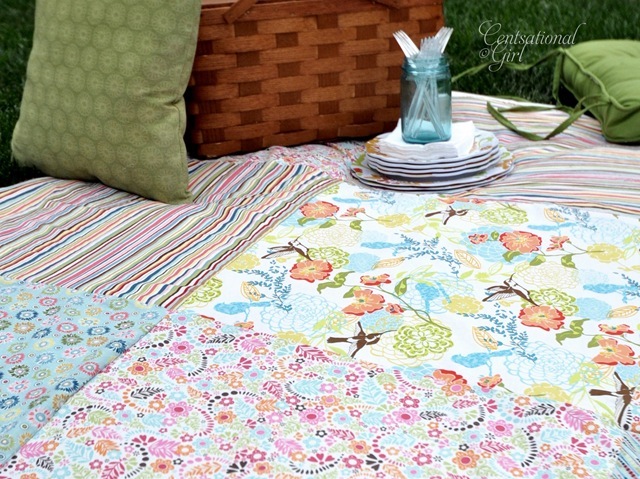 I absolutely love the bright colors, the mix of blues and pinks with orange and turquoise. 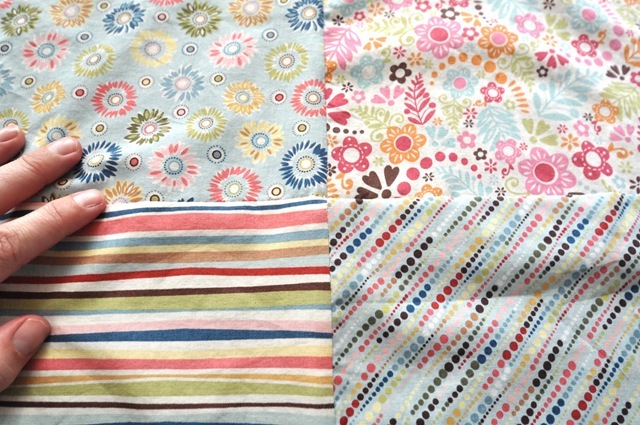 The patchwork nature also has that quilted nostalgic feel. There is one final bonus beyond the handmade appeal. This version is water resistant due to the vinyl tablecloth sewn to the underside. It makes for one blanket I can throw down on any lawn, moist or dry. It also means it still multitasks as a tablecloth !! 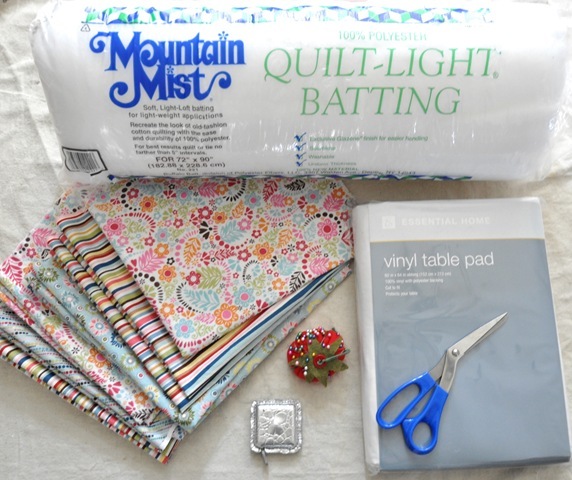 Supplies You Will Need: complementary fabrics cut into squares; vinyl tablecloth (or other water resistant fabric)*; light quilt batting; measuring tape; pins; thread; scissors; needle; sewing machine. *I found my white vinyl table pad at Kmart for $8, and my cotton fabrics at Joann’s Fabrics. 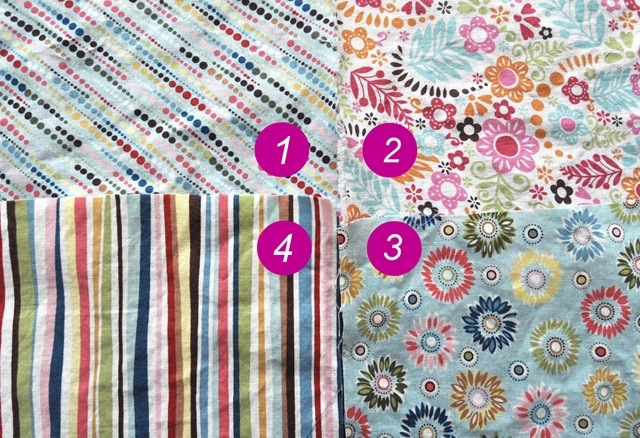 There’s no real magic formula to choosing fabrics, just look for patterns that appeal to you that share similar colors, whether it’s classic stripes or ginghams, or modern geometrics or florals. 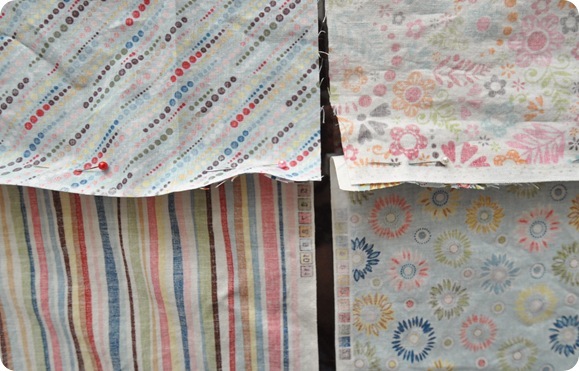 Prewash all of your cottons before you start, then cut your fabric swatches into squares. 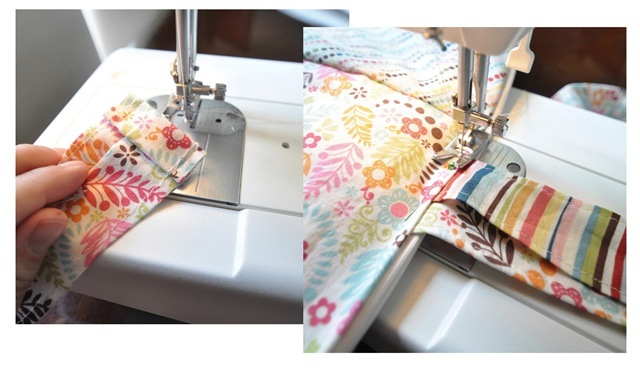 Since I used a 60” wide x 82” long vinyl tablecloth as my base, I wanted three 20” squares across and four 20” squares in length, so my 12 fabric squares were all cut to 21”, allowing ½” seam allowance on all sides. Faux croc silver mini measuring tape, how do I love thee? Let me count the ways. 1 inch, 2 inches, 3 inches . . .
Once they’re cut, lay all of your squares down on a large surface and decide where they should fit in your final pattern. Obviously, the next step is sewing your squares together, so I just started pinning. Don’t do that cause it ain’t that simple. I ended up with this puckered ridiculous mess. Then I thought, well obviously someone else has figured out how to get the perfect seams and how to get your points to match. Quilters must have the secret I reasoned. So I went online. Don’t you just love the internet? When I was young, it was “Hey kid, go look it up in an encyclopedia.” Now we have Google. Amen. I found a helpful video on how to nest patchwork quilt seams and learned a very useful technique on how to get your points to match. Sound completely intimidating right? “Nest. Patchwork. Quilt. Seams.” Aaaaahhh! I admit, I was afraid. Very afraid. But I watched, and listened, and learned. You quilters sure know what you’re talking about. Looky loo at my crisp points! Never thought I’d hear myself say that. Crispy points! Crispy points!!! 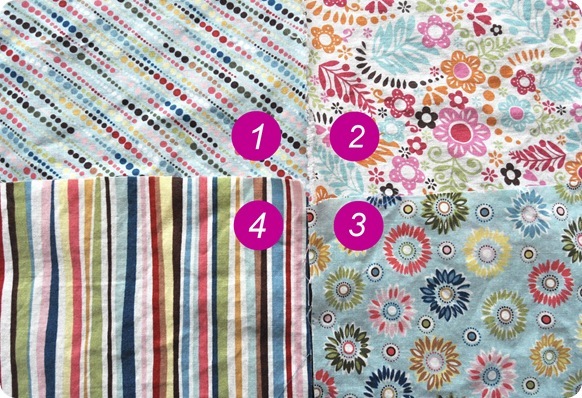 Work with four squares at a time and decide your fabric placement. 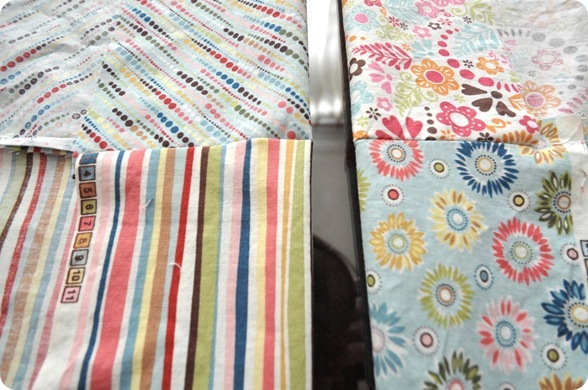 Flip them upside down, and pin squares 1 and 4, and then 2 and 3 together, then sew those sections on sewing machine. 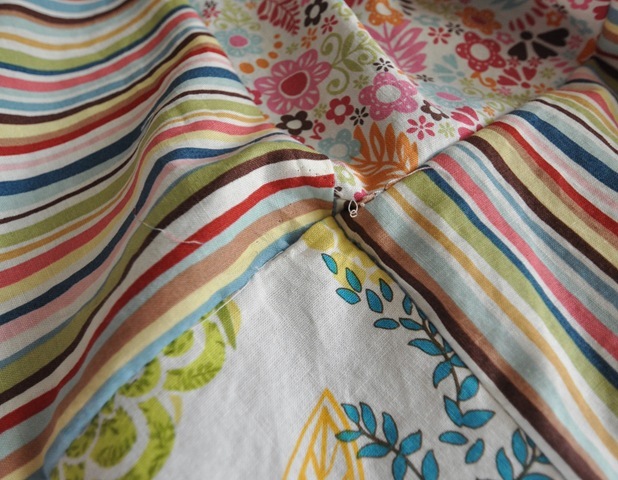 Match up your new seams to each other, then (like in the video) pin them together, and hem for the perfect matching points. Seeeew easy. Hardy har. Work your way around, adding two more sections at a time, following the nesting corners method. Then pat yourself on the back and have a glass of wine. 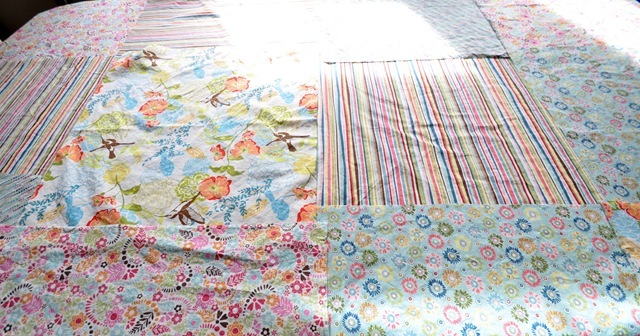 Next, flip your completed patchwork cotton patchwork pattern upside down, add the batting on top of that, and then your vinyl tablecloth (also flipped inside out). No pic, sorry, it was late at night. 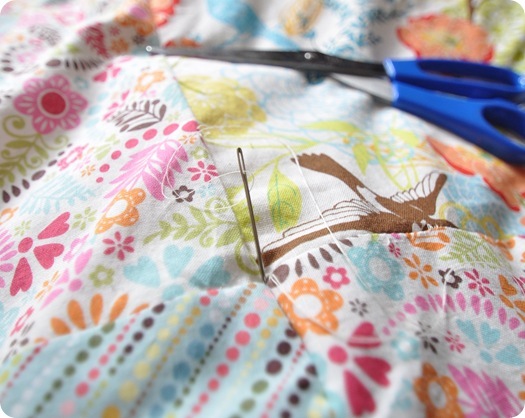 Sew it all together all around, but leave one square open to flip it right side out. 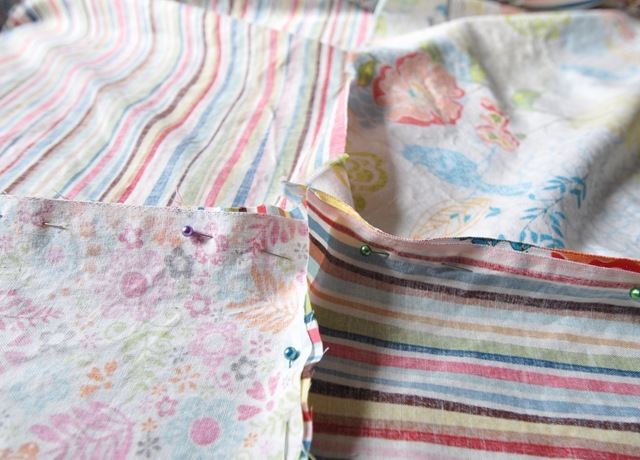 To hold it together if and when it goes through the wash, either sew along the seams between the patchwork pieces, or tack together with a few stitches by hand (like I did) where your fabric meets in each corner. The last step is those charming colorful ties, it’s the easiest part, you’re almost done! 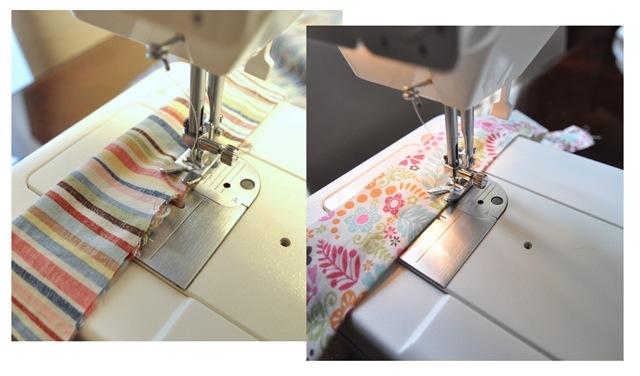 With your fabric scraps, make a long tie (approximately 30” long) by flipping a 3” strip inside out and sewing one long seam. 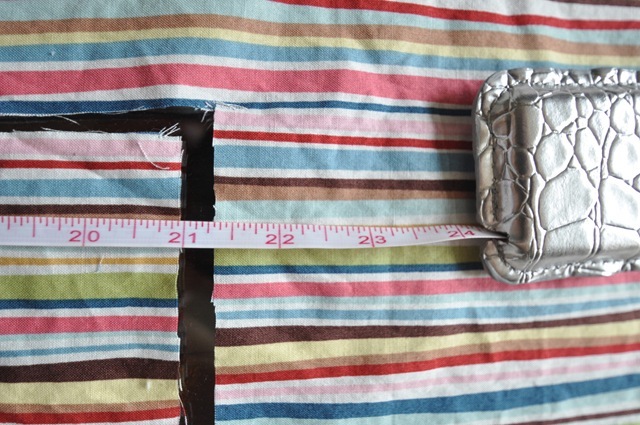 Work a safety pin through to flip the fabric right side out, then seam both edges so it will remain flat after it goes through the wash.
Seam the edges, then attach both ties to that final unfinished edge of your last square. Close up that last square of your picnic blanket after those ties are attached. The nicest thing about those charming colorful ties you make? The perfect package they make at the end of your picnic. This was a time consuming project, considering my learning curve. It took me 6 hours over two days from start to finish, but it was completely worth it for this new keepsake. 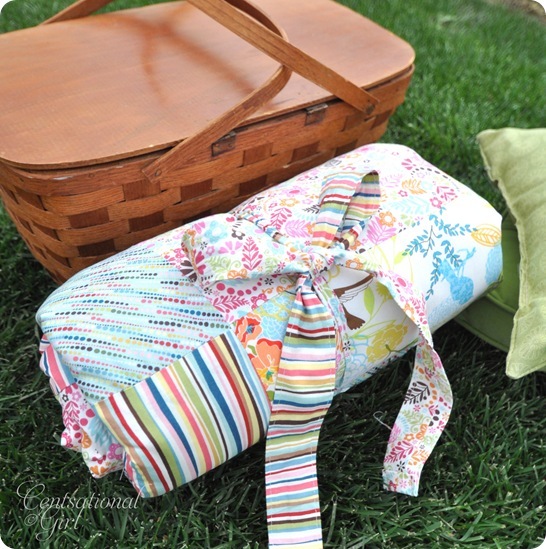 This classic picnic basket was a fun find from an antique store, and we pack it with plates, napkins and goodies on our local adventures, even those as near as our own backyard. Now let those warm weather outings begin!